Sorry everyone, but the forecast says there is rain for Saturday. However there is a great alternative dance event we can go to! 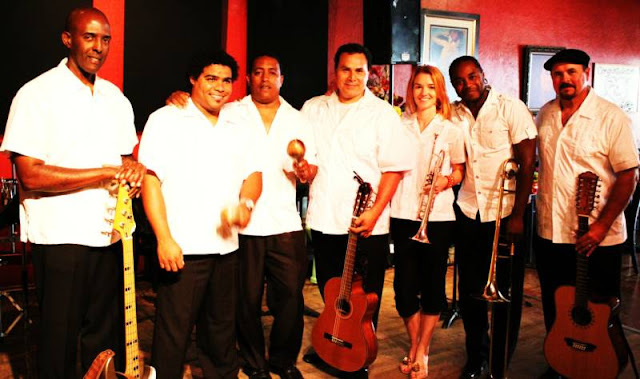 A brand New Cuban band called Q-ban Street with musicians you might know from Palomar College and from Kimba Light and from La Farandula de Cuba. Click this link to see the event post I just made! HOW TO PREPARE: Dress in layers; if it rains we will announce an indoor location. Bring a snack to share. Bring water. SPREAD THE WORD! 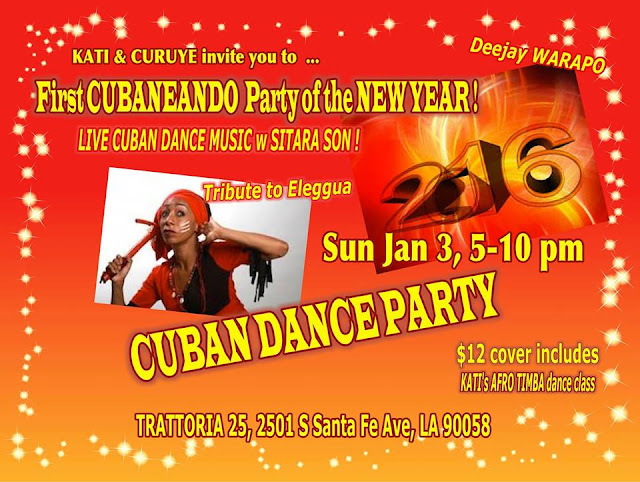 KATI & CURUYE’s first CUBANEANDO CUBAN DANCE PARTY of the NEW YEAR is SUNDAY JANUARY 3-- START 2016 DANCING to the LIVE CUBAN SOUNDS of SITARA SON, and DEEJAY WARAPO dropping those CUBAN SALSA, TIMBA, REGGAETÓN, RUMBA BEATS at TRATTORIA 25, 5-10 PM! You’ll want to sample something from Chef Simon’s varied menu. BRING SOME FRIENDS & LET's DANCE TO 2016! COST: $12 cover includes Kati’s dance class. SAVE THE DATE Sunday, January 17th! Alex Ruiz, Rueda de casino instructor and Director of Salsa Mia from South Beach Miami will be coming to Carlsbad to teach casino/rueda dance workshops on Sunday, January 17th from 12noon-4:15pm. It's not too late to get your tickets for the largest Salsa/casino/rueda festival in the US. Incredible dance instructors, the dancing parties are out of this world and the live music is awesome. If you are looking to learn casino, they have a beginner's track taught by amazing casino/rueda instructors from all over the US. 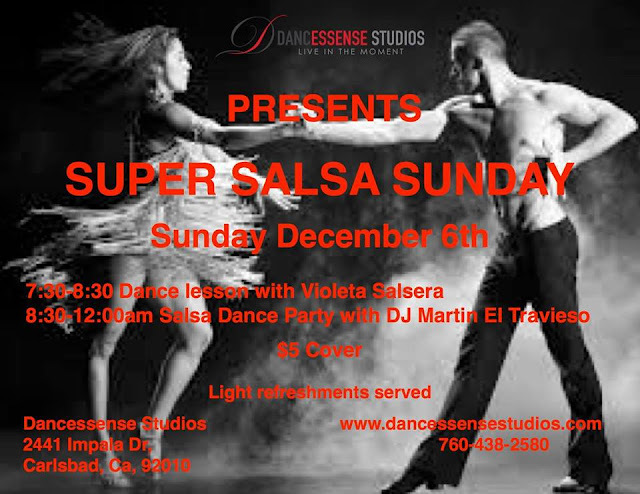 If you are a salsero, this bootcamp is for you! If you have never tried casino but you always wanted to learn, it's like getting the cream of the crop for teachers to teach you. It's a small investment for a lifetime of dancing socially. Below is a snapshot of their website. I am smack-dab in the middle of this photo! I go every year. It's a tradition like a national casinero reunion holiday weekend. Come join this timba haven at least once in your life! The information below is directly from the festival website. Click the screenshot above to access the website. LODGING: Hotel Whitcomb or Holiday Inn next door. Details about how to reserve with the festival hotel price, click here. Brought to you by Chereve Entertainment, Charlie Chavez y Su AfroTruko are playing live at a newly opened music venue in Downtown San Diego. If you remember Anthology which closed a few years ago? This is the same place with a new owner and new name Music Box. Come celebrate the holidays dancing inside a chic new music venue with one of our favorite bands. Casineros will be in the da'house! We'll be coming from Casino on AstroTurf in Solana Beach, ready for Round 2 for dancing. Casineros have been asking for this in San Diego! Ruchi and I are going to lead this effort. 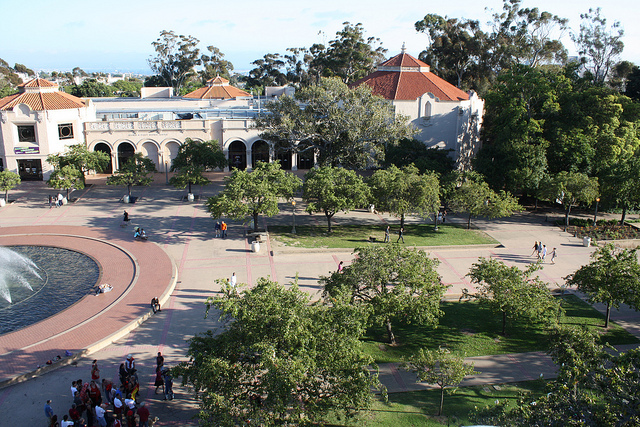 Come dance with us for a couple of hours in Balboa Park next to the Bea Everson Fountain on the Prado Walk side (See Picture below). Consider this a rueda "practice" not so much as a class for beginners, but a review of rueda moves, for all. We will let you know if a rueda is a beginner level or an intermediate level. We just want to dance as much as possible to warm up on some cold days to come this winter. HOW TO PREPARE: Layer up, it's going to be cold but as long as we are consistently dancing then we will stay warm. Bring some water and snacks if you like. Keep Warm & Dance Rueda this Winter! We are back on the AstroTurf for December installment of Casino on Cardboard (AstroTurf) in Solana Beach at our favorite spot on Saturday, December 19th! 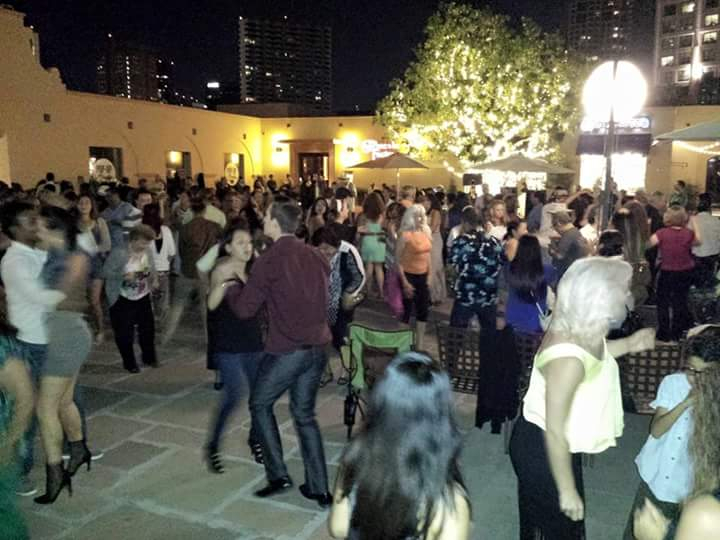 Join us for some fun ruedas, salsa suelta and just plain old on-on-one casino dancing. 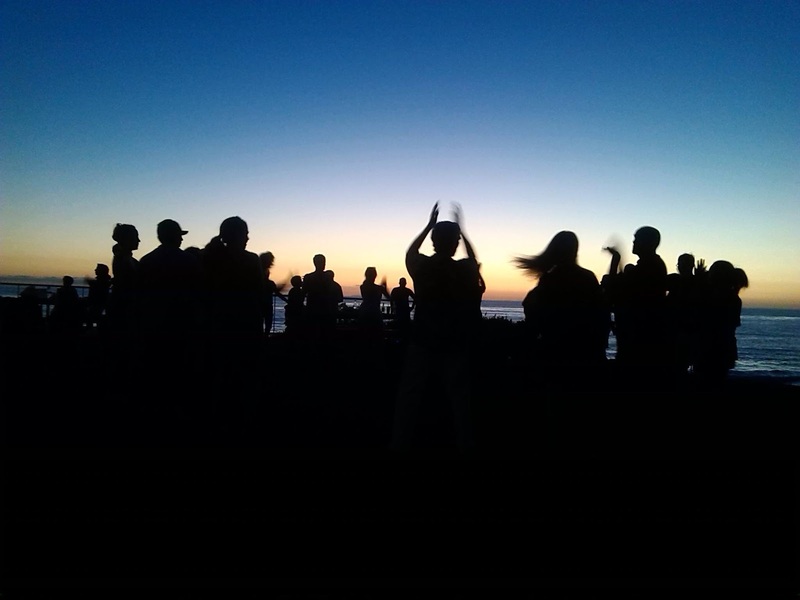 Bring your camera to capture the sunset while we dance. What to bring: a snack to share and something to drink. This is a family-friendly event. Layer up as the sun goes down, so does the temperature. If you dance a lot you will be peeling off layers, if you don't come with layers and bring blankets and chairs. 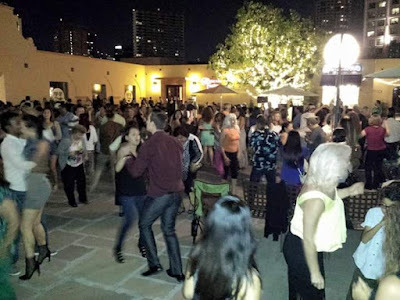 If you have not attended one of these events, put it on your calendar to come and dance salsa literally under the stars, outside with natural air-conditioning from the San Diego Bay. Manny Cepeda Orchestra will be out there playing live and then DJ music played in between breaks. 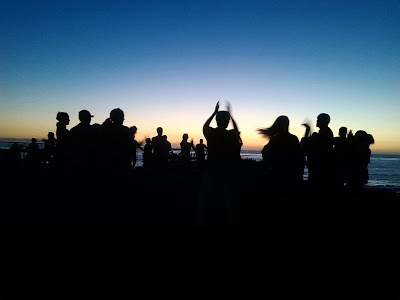 Summer may be over and so will Fall but....it's San Diego....we can still dance outside and work up a good sweat. Casineros will be in the crowd. 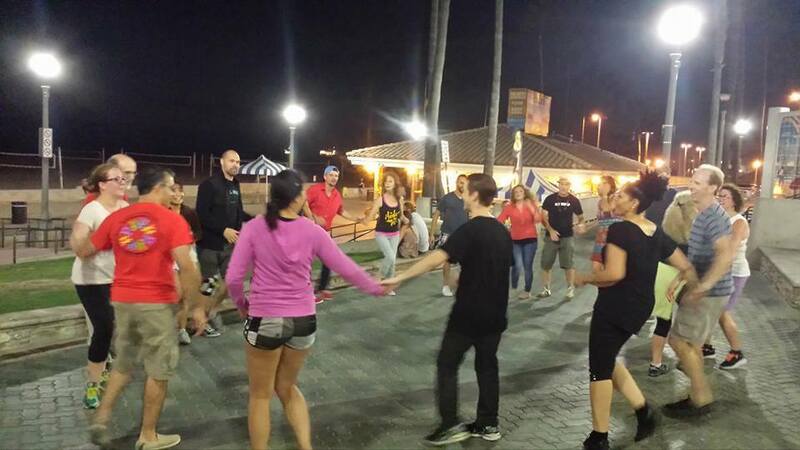 Come on down to Huntington Beach pier and join in on the fun as we dance Cuban salsa and rueda de casino! We play non stop timba from sundown until...? Pretty much until the feet just don't want to move anymore. Plenty of lights and excitement to keep us going. There is no class given at this location but there are always instructors on hand that can recommend a class. Look for us on the North side of the pier just in front of the grassy area. Una bulla! WHERE: Next to Huntington Beach Pier; Use this link for Google Map directions. HOW TO PREPARE: Come layered up as the weather can get chilly. Bring a snack if you like and comfortable shoes to dance on concrete. 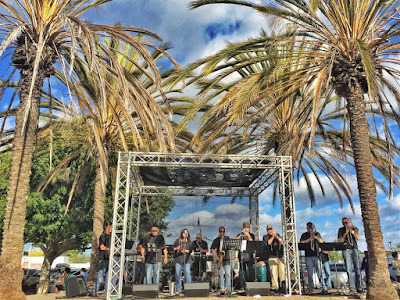 Combo Libertad, North County San Diego's very own "son" band is playing again at Club M at the Hotel Grand Del Mar on Thursday, December 17th! Combo Libertad will be playing live that night so you can get your "son" on. DJ will play regular salsa and bachata, probably no timba but its a chance to dance casino with some friends. This is also Isela's birthday soiree meet up so come wish her a happy birthday. Cost: Free concert but there is valet parking ($10) OR you can walk a couple of minutes from the FREE hotel parking lot and you have the whole experience for free....unless you order a drink. All Night Happy Hour and specialty rum drinks at the bar for purchase. The casineros will be in da' house tonight for Super Salsa Sunday at Dancessense Studios in Carlsbad. Come join our meet-up there for some casino-dancing fun!